Only five New Mexicans gave a total of $32,000 to the joint fundraising committee that held a $10,000-per-person event in Albuquerque in late May. It’s unlikely the Trump Victory joint fundraising committee raised the $230,000 some might have expected for the May 24 event attended by 23 people who had paid to be there. 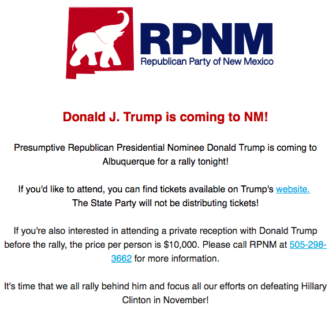 A spokesman for the New Mexico GOP gave NMID that attendance number last month. Three New Mexicans donated $10,000 each while two others gave $1,000 each to the Trump Victory committee, according to a report filed Friday with the Federal Election Commission listing donations through June 30. Another joint fundraising committee for presumptive Republican presidential nominee Donald Trump netted $13,450 from New Mexicans during the same period, records show. That committee wasn’t part of the May Albuquerque event. That means the two committees raised less than $50,000 from New Mexicans. New Mexico fundraising numbers for Trump, who this week will officially become the GOP’s presidential nominee in Cleveland, reflect a national pattern: Trump is raising far less with the GOP than Democratic presidential nominee Hillary Clinton is raising with the Democratic Party. The Hillary Victory Fund, formed in September 2015, has raised nearly $335,000 from New Mexicans, with 82 percent — or nearly $275,000 — coming between March 1 and June 30. To be fair, the Trump groups didn’t begin raising money until late May so it is unclear if fundraising will pick up for Trump in coming months. Trump Victory held its first fundraiser in Albuquerque, listing a $10,000 per person donation for a photo-op and reception with Trump before he addressed a rally at the Albuquerque Convention Center. Retired funeral home owner Kevin Daniels, identified as the host of the event, donated $10,000 to Trump Victory, according to the FEC report. Former gubernatorial and U.S. Senate candidate Allen Weh and his wife, Rebecca, each donated $10,000, too. Allen Weh’s daughter, Debbie Weh Maestas, is chairwoman of the New Mexico GOP. Suzanne Fuqua, a Santa Fe real estate broker, and W.P. George, a Santa Fe attorney, donated $1,000 each to Trump Victory, though it’s unclear if they attended the fundraiser. The dates of the five donations were listed as May 31 and June 3. None of the four Republicans in New Mexico’s 2014 top 10 donor list has donated to the Trump joint fundraisers, according to FEC filings. New Mexico GOP spokesman Tucker Keene did not respond Monday or Tuesday to several questions from NMID about the fundraising details. Residents from Wyoming and 27 other states exceeded New Mexico’s $32,000 in donations to Trump Victory. Topping the list were Californians and Texas, with residents from those states donating more than 42 percent of the committee’s $25.7 million. Meanwhile, nine Texans and four Arizonans donated $10,000 each to Trump Victory during June. It’s possible people from out of state could have attended the May 24 fundraiser. The Albuquerque event was the first Trump fundraiser held in conjunction with the Republican National Committee, although Trump’s campaign said its first fundraiser was the next day in Los Angeles. And Trump Victory didn’t file a statement of organization with the FEC until May 25. 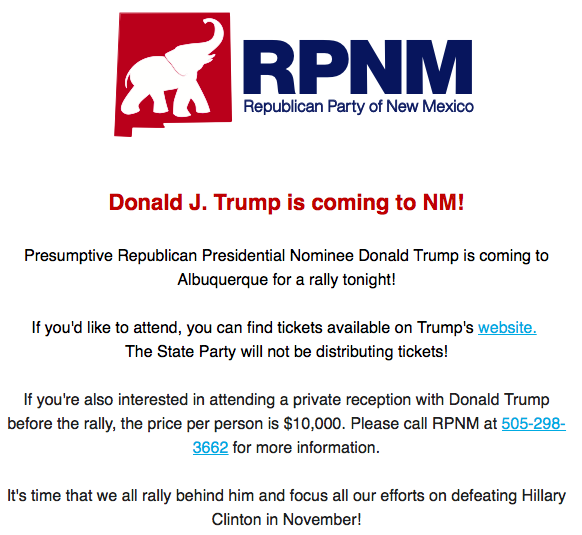 But the New Mexico Republican Party sent notices of the fundraiser and the Trump rally on May 22, 23 and 24. As a joint fundraiser, Trump Victory shares proceeds from events with the Trump campaign, the RNC and 11 state GOP committees. The committee may raise up to $449,400 from each individual donor, with the Trump campaign receiving $5,700 of that and other committees dividing the rest. Of the $25.7 million Trump Victory raised through June 30, $2.2 million went to the Trump campaign and $10.1 million went to the RNC. The New Mexico GOP, which sent invitations to the May event, is not among the state committees participating in Trump Victory. Trump Victory paid $875.45 to rent the Albuquerque Convention Center, according to the FEC report. The Trump campaign won’t file its monthly finance report until Wednesday. Meanwhile, 340 New Mexicans have donated nearly $335,000 to the Hillary Victory Fund. The largest New Mexico donations came during late May. Top donors include Barrett Toan and Paula O’Brien, of Santa Fe, who each gave $25,000; Anne Bingaman and Catherine Oppenheimer, both of Santa Fe, Allegra Carpenter and Kathleen Love, both of Albuquerque, who each gave $10,000. That joint fundraiser divides its money among Democratic presidential nominee Hillary Clinton, the Democratic National Committee and 32 state committees. The New Mexico Democratic Party is not among those committees. A full list of donations from New Mexicans to the three joint fundraising committees may be found here. Explore New Mexico’s state Senate campaign finance with an interactive map and table showing where candidates are at with fundraising and spending.